The Bryn Mawr School was founded in 1885 in order to provide girls with the same educational opportunities that boys enjoyed, which included an emphasis on physical activity. Now, more than ever, we know that participation in sports helps develop strong, self-confident, well-balanced young women. We continue to celebrate the challenges of competition and appreciate the lessons for life that sports provide. 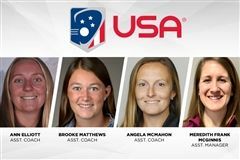 Bryn Mawr’s varsity lacrosse coach and assistant athletic director was selected as an assistant coach for the U.S. women’s U-19 national team by US Lacrosse. Matthews will be one of four assistant coaches to help lead the 2019 team, under the direction of Head Coach Kelly Amonte Hiller. 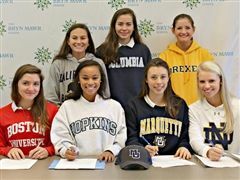 Seven athletes from The Bryn Mawr School decided on their colleges as they sign their National Letters of Intent. Bryn Mawr was able to squeeze out a victory over McDonogh at the A Conference championship. This year's golf captains discuss their goals for the team. JV lacrosse team captains discuss their team goals. The Varsity Lacrosse team captain speaks about her goals for this season. The Varsity Track team captains discuss their hopes for their team this season. Is it really a good idea for kids to play a sport all year round?